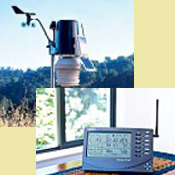 Both the Weatherlink and Weatherdisplay software programs collect and store the data from the Vantage Pro2 Plus with FARS and write files to their respective data bases. Both programs also upload the data to this internet site 24 hrs a day, occasionally the station will be offline while the computer server is rebooted. This will most likely occur in the early morning hours between 2am and 6am local time. Both of our Anemometers are mounted on 10ft poles that rise above the roofline or about 20ft off the ground,(pictured left). There are no immediate major obstructions to block wind speed or direction readings. The exception is a couple of palm trees to southwest that may cause a minor obstruction that may slightly block wind speed readings, when southwest winds occur, so the wind readings appear to be fairly accurate. 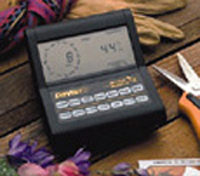 Davis rates the anemometer at +/- 5% for wind speed and the wind direction at +/- 7�. 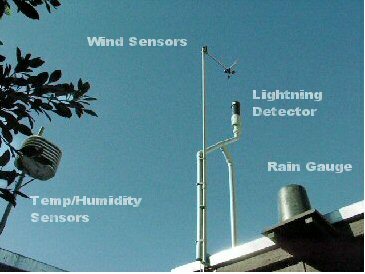 The automated rain gauge for the Weather monitor II, (pictured above), is fairly accurate and it is backup by a weather bureau standard issued rain gauge. However sometimes minor adjustments are necessary to bring the two gauges into agreement with one another. The barometer is periodically adjusted,(approximately once a month),with the reading at Sky Harbor Airport.